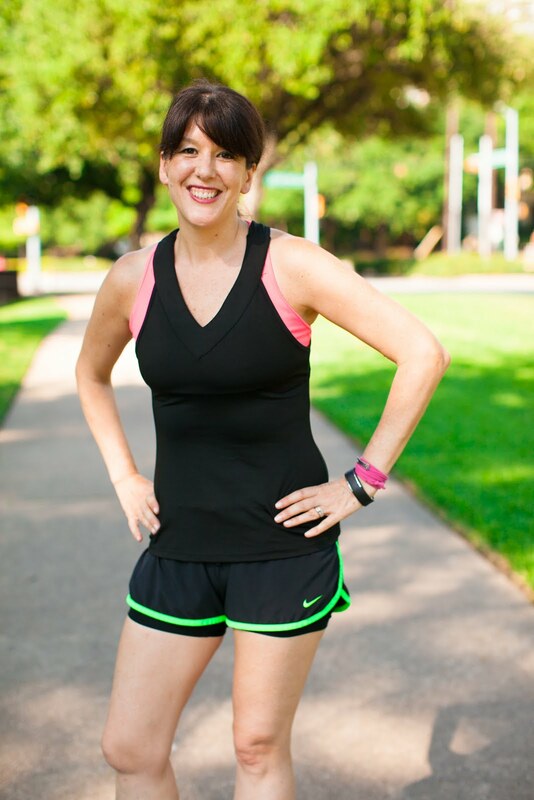 RUNNING WITH OLLIE: What's in Your Fitness Closet? 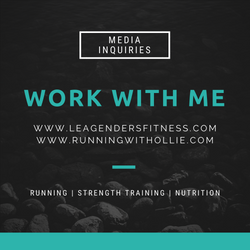 When fellow running blogger and Fitfluential ambassador, Pavement Runner, threw out a blog post idea in a Facebook group, I was intrigued. 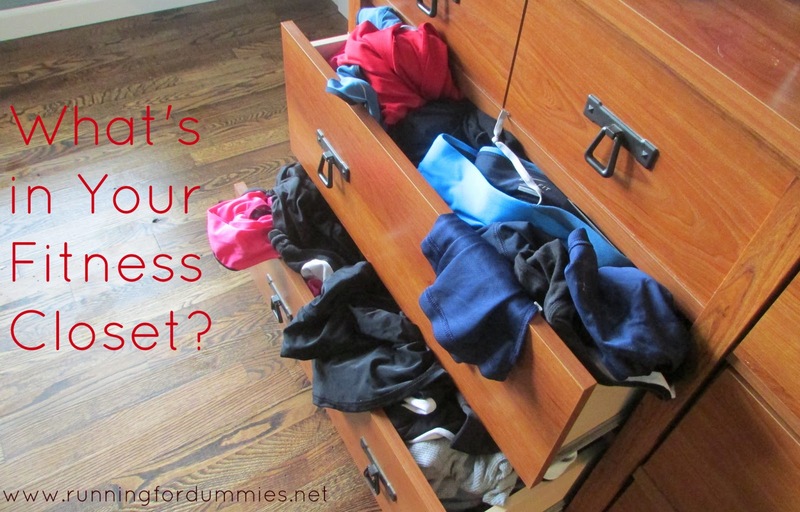 What's in your fitness closet? I wanted to participate, but I don't exactly have a fitness closet, more like fitness drawers, and terribly messy, unorganized ones...just ask my distressed husband about it. I am not ashamed. Or maybe, more accurately, I have no shame. The message I would like to convey, and one of the reasons I decided to air my dirty laundry (OK, most of that mess is clean), is that I don't believe you need to buy expensive work out gear. 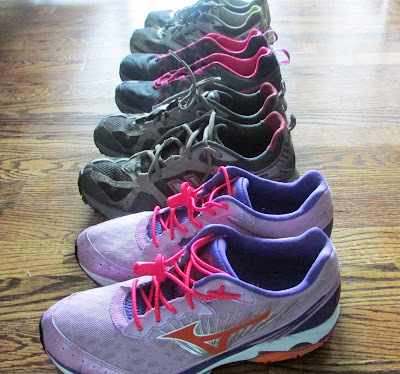 The only piece of gear that should be a big investment into running is your shoes, don't skimp on good shoes. You simply don't need fancy or expensive clothes to work out. It is a luxury. A luxury I indulge in at times, but a luxury. 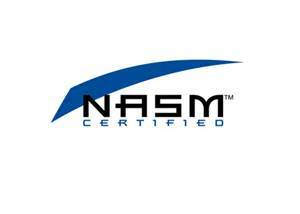 It it most important to know what to buy in terms of fabrics and fit and what is most comfortable to you. I stay away from cotton or cotton blends to work out. 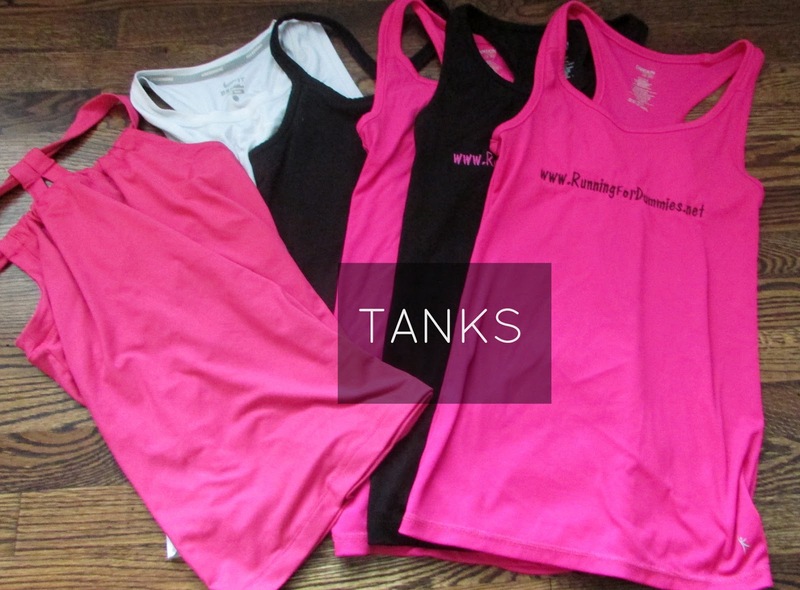 I usually look for tanks with wicking fabrics and then layering pieces for cold weather. I always prefer shorts, but when I need more warmth, I like pants that fit close to my body. I like fashion forward work out clothes too. I need the basics, but I love a cute skirt to wear to races. These are just my personal preferences. I buy a lot of my everyday work out clothes at Wal-Mart, their Danskin line usually has pretty cute, inexpensive pieces. I also regularly shop at Target for work out clothes, they have super adorable stuff, but sometimes I think their prices are a little on the high-side for store brand merchandise. I also shop at Kohl's for discount name brand gear. Not to say that I don't have some pricey pieces. Sometimes I splurge because fitness clothes make me feel good. There are times when I would rather spend the money on a cute new work out skirt or shorts than something to wear to the office. I have awesome friends and a hubby who regularly buy me gift certificates to my favorite running store and fancy gear for birthdays and holidays, which helps fund some of my more expensive desires. Sometimes I am fortunate enough to have the opportunity to review clothes on this blog. If those more expensive clothes have features or styling that just aren't available in the inexpensive clothes and it is a must-have, I go for it, but most of the time my every day work out gear suits me just fine. Here is my fitness "closet" slightly more organized than that messy drawer. I love running shorts and skirts. It is what I wear most often. 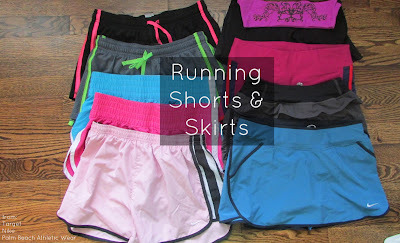 Here I have shorts and skirts from Target, Nike, and Palm Beach Athletic Wear. As you can see, I love color. 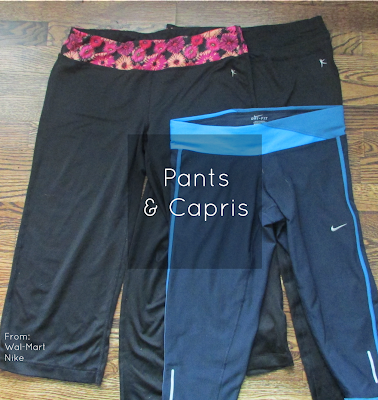 I don't wear pants as often (that sounds weird, but you know what I mean), but have a few pair for cold weather running. Here I am showing clothes I have from Danskin and Nike. I love tanks for running. As you can see, I love pink and black. I even have some custom 'Running for Dummies' tanks. Most of this is Danskin from Wal-Mart, plus the white tank is Nike. Here are some of my favorite tech race shirts that are in regular rotation. 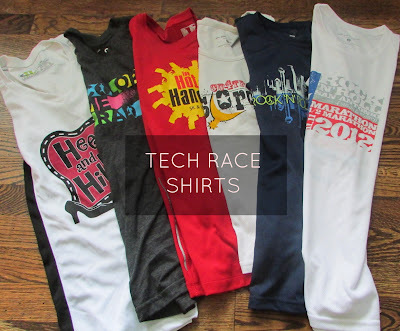 If I get a cotton t-shirt from a race, I usually donate it to charity, I don't have any use for those shirts. No running closet collection is complete without running shoes, here I have shoes still in rotation from Mizuno, Nike, and New Balance. Thanks to Pavement Runner for the topic inspiration and for giving me the opportunity to organize those disastrous drawers. How about you? What's in your fitness closet? My closet looked similar to your first pic but mine are exploding out of storage containers. Having lived in hot climate for a while I still have more dry wick tanks and tempo shorts than anything else. One of my favorites to buy from is Road Runner Sports. They're stuff is great and affordable. i'm jealous of all your bright colors. i tend to stick with darker colors. need to branch out! Great post.. they look so happy in the drawer. Like they are all hugging each other. Agree that you don't have to buy expensive clothes... it all gets sweaty anyways, right? well i have so many other clothes, most of my workout stuff is in a basket on top of our safe. lol.I love target for their drywick workout tees but also scour the clearance racks and at ross/tj maxx for bottoms. Love your post, I too don't have a lot of expensive items, what I do get is always on sale. My shoes are always my main focus, I love my Asics 2170GTs! I love getting new running gear. Sometimes I don't even need it! Love those sparkly shorts! It's funny how good looking workout clothes can be such a motivation to get into the gym.